Rock the Rhythm, Lead, and Bass Guitar tracks in the follow-up sequel to "Guitar Hero." Form your guitar duo and shred riffs cooperatively or go head to head in all new multiplayer modes. With over 55 tracks to rock out to, you'll go from Guitar Hero to Guitar god in one press of a fret button. Choose from multiple rock characters and jam at concert venues that grow in size as your rock career progresses. You'll start your rock career playing small clubs and bars, but if you play well you'll work your way up to stadiums and arenas. 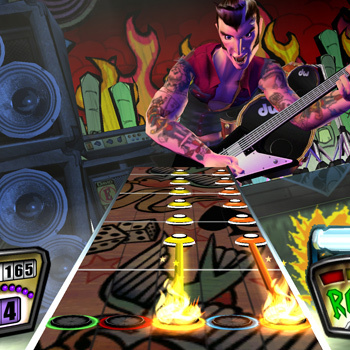 Guitar Hero II takes the guitar rock experience to new volumes by allowing players to play 3 different guitar tracks: Rhythm, Bass, and Lead. Guitar Hero II introduces all new multiplayer modes like: cooperative, pro-face off, and face off, letting 2 Guitar Heroes conduct their own symphonies of destruction. Shred School : Guitar Hero II features an all new practice mode, allowing Guitar Zeroes to become Guitar Heroes with enough practice.